Is There A Clearance Page From State Line Tack? ● Enjoy free economy shipping deliveries to the lower 48 states with selected products such as western saddles. Keep an eye out for Free Shipping notations in the product description while browsing for items. A flat rate of $3.99 is available for orders worth over $100 and weighing up to 15 pounds. ● View the latest coupon deals under the Quick Links on the bottom of the homepage. Save as much as 15% off your entire order with these limited-time-offer coupons. ● Check the Clearance and Special Promotions pages to view hundreds of items marked down by as much as 60% off regular prices. ● State Line Tack regularly holds special giveaway promotions, which usually require joining the site’s mailing list to become eligible to win. ● Save 10% off your favorite horse supplies by choosing the Auto Ship option on selected products. Choose how often you need your supplies and State Line Tack automatically ships out your order every few weeks or months, and charges your account with the discount already applied. 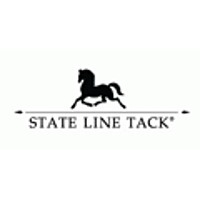 State Line Track is a specialty retailer that has horse riding gear for kids and adults. On their website you can take a look at their apparel, English saddles, footwear, Western saddles, blankets, and more. They also have an extensive collection of products for your horses such as stable supplies, supplements, and wormers. If you want to look at all of the items that they have for sale, take a look at the “Shop All” tab. If there are any sales and/or promotions available, you can easily see them on the front page of the site under the navigation bar. For most up to date offers check out State Line Tack on Facebook and Twitter or contact State Line Tack Support for any questions.